This plan can be used to create a great piece and many variations can be made by experimenting with different woods. The random segment placement can be varied to create many different patterns. 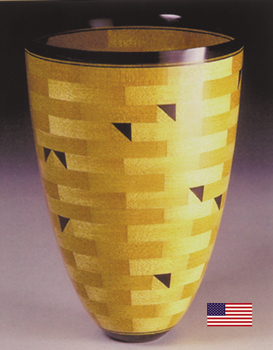 The finished size of the vase is 4-1/2" diameter by 6-1/2" tall. Skill Level -3 To complete this project you will need: glue, clamps, sander, bandsaw and stationary belt sander. This plan has nine pages that include a color photo, an exploded view of the project, clear description of materials and procedures, details on segmented construction, laminations instructions and a template to assure the correct shape of the finished turning.